The Catahoula Bulldog has been around for over 100 years. 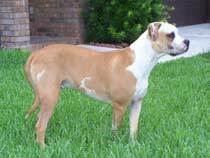 They are a crossbreed between the American Bulldog and the Louisiana Catahoula Leopard dog. In order to understand what this cross exactly means, first read my article about the Catahoula Leopard dog. So, for what reason was a versatile and intelligent working dog, like the Catahoula Leopard Dog crossed with another breed? Breeders of the 'Catahoula Bulldog" say it was bred for two reasons. First, ranchers and hog-hunters have used "Catahoulas" for many years to herd cattle and hunt hogs, but, to catch hogs, they had to carry a "catch-dog" with them. According to the Catahoula Bulldog fanciers, most "Catahoulas" were neither big enough, nor tough enough, to catch. 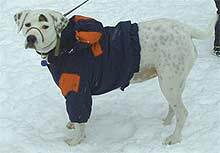 The "American Bulldog" has an impeccable reputation as a catch-dog. Therefore, they say, when the "American Bulldog" is crossed with a "Catahoula", you get a bigger, tougher dog which will work cattle and also catch hogs when needed. The second reason is that the Catahoula Bulldog is an excellent bear dog because it has the size and aggressiveness of the American Bulldog, and the intelligence and hunting ability of the Catahoula leopard dog. 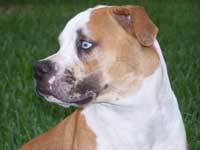 The American Bulldog gave great strength of jaw, a heavier body and a laid back attitude. It also beefed up the head of the Catahoula lending itself to a wider skull. The Catahoula Leopard Dog added intelligence, speed, endurance and the instincts of hunting and herding. They also added an astonishing array of unique coloration's known as merle. As a result of its bulldog ancestry the general character of the Catahoula Bulldog is laid back yet alert when necessary. Catahoula Bulldogs come in a wide variety of colors. A pure white coat is commonly seen with or without striking ice blue eyes, a soft sable brown and white coat with or with out merle, or the merling patterns. Merling produces a huge range of colors and patterns. Some are white with gray, black and tan patches and blotches; some have very large areas of color and smaller patches and spots. You truly have to see it to believe it. Not only are they excellent working dogs but they are also esthically amazing to look at. The appearance of the Catahoula Bulldog is a medium to large size dog that weighs 75-100 pounds and stands 24"-26" at the shoulder. 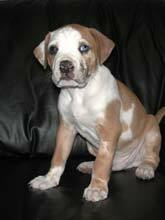 He has the musculature of the American Bulldog with tight skin and a very short smooth coat. Normally he does not have an undercoat but usually develops one when living in seasonal or colder climate. Their ear set varies from a rose type to button over and sometimes cropped for a regal look. They tend to use their ears in a very expressive manner, as if they are talking with them. His eyes can be a soft to dark brown, ice blue, emerald green, gold or any combination of all of these. send us your Catahoula bulldog pictures ! Mr. Stodghill of the Animal Research Foundation began to register Catahoulas in 1951, and in 1958 received a letter from a gentleman in Louisiana of French ancestry who... "said his grandfather had brought a pair of leopard spotted (Beauceron) dogs from Paris, France, to the Catahoula area of Louisiana 150 years earlier, and he thought all Catahoula Leopards in Louisiana went back to that pair." They are a unique and extraordinary dog possessing wonderful qualities and high intelligence. It can be trained for several uses. They make excellent watch, guard, and catch dogs. They will hunt and tree game and can basically be considered as a working breed. As pets they are easily trained and are very loyal to everyone who intimately surrounds them. They love to be around their family and are very tolerant with children. 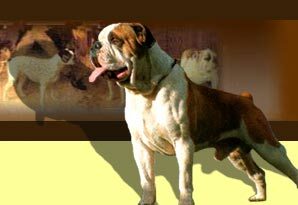 Howard Carnathan did a lot of early work in developing the breed. He wrote a letter to Mr. Stodghill, the director of the Animal Research Foundation in 1960 giving information on the breed. "I needed a dog that would be a companion and protector to my children and home yet also was in need of a dog that would help with the farming duties. The mixture of the Catahoula Bulldog fit my purpose exactly". 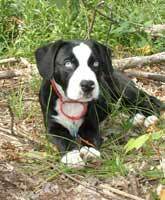 As far as we know there are no books specifically on the Catahoula Bulldog. However, much of this dog's characteristics can be explained by its Catahoula Leopard Dog's ancestry. The book below by Don Abney gives you thorough information about the Catahoula Leopard Dog.